Live Life. Leave a Legacy. We are on the final stage of redecorating our new office building. If everything goes well, we will be working in the new facility this January. Yay! About two years ago we were not sure whether to find a new place. Yes we had been occupying our present location for 18 years. Yes, there were some things that we felt wanting from the place. It used to be a large single story house. There used to be a large affluent family who lived there. The children grew up, and one by one left the house to start their own families . Until there was only the widow mother. The house felt too big for her, and she wanted to live in a smaller residence. So she sold the house to us. Out office used to be in the house that my parents built in the 70s. We lived in the upper floor, and the office occupied the ground floor. For sometime it was great. Until the place became too crowded and my parents decided to move us away to the southern part of the city. 6 years later, the local government began building an outer ring road, circling the perimeter of the city. Out house was right in the middle. So we had to move again. My parents renovated the first house to accommodate both home and the office. Once again we lived above the office. 10 years later my parents built another house on the land across the street, and the old house once again became a full office, albeit only for a year. We moved the office to its present location. And for 18 years we stayed there while the business flourished. We felt we need to have a proper office. Not a residential building, but a proper office building. But there was no hurry, and we oscillated between the ideas of staying there or getting the new building. We finally made the decision to move when the governor issued a decree banning residential houses from being used commercially. The government refused to renew our business license until we would move to a commercial area. We shopped around for a new place but the prices were prohibitive. It was either affordable but too small for our company, or big enough but too expensive for us. There was this 6-storey, beautiful office buildings near our old place. I once went pass it and thought how nice it would be to work there. But it wasn’t for sale. And even if it was, we didn’t have the money. As fate would have it, just at the time we were able to raise the money, the place went on sale! What a miracle! We contacted the owner, negotiated a deal, and once the legalities were done, we now own the building. So there it was. After.40.years in the business, we finally have a proper office. A long, winding road, that got us where we are now. I don’t know what to say. Life doesn’t go as you expect. Just be patient and enjoy the ride. I have been absent from blog writing for a long time. I kept delaying from writing a post because I felt that I didn’t have anything to say and I had lost the will to write. I happened to read some notes that I wrote on Facebook and realized that writing isn’t about making a bestseller novel. It’s about pouring your heart into your piece. So to jump start a return to blogging, here’s a piece that I truly enjoyed writing. Originally a Facebook Notes post dated October 3, 2009. After a 4-hour delay, I was finally strapped in my seat with 135 other passenger of the flight from Medan to Jakarta. It was already past 11 PM when the pilot revved the engines of the plane and brought it airborne into the night sky. It was the worst – and the most dramatic – delay I’ve ever experienced. My wife had warned me of the disadvantage of taking the last flight out. “It will be delayed,” she said. But being the positive, happy go lucky person, I somehow believed that the airline had learned its lesson and would do its best to avoid delays. Boy, I don’t think I’ve ever been more wrong in my life before. I received the text from my staff at the office informing of the ‘change of flight schedule’, from 7 PM to 9.40 PM. I was incensed. “They cannot do this! They must take responsibility! I have the right of having the airline arranged a better flight for me!” thus my ranting went on inside my head. Yes, the regulations require an airline to transfer a passenger to a better flight upon request, should a more than 90 minute delay is inevitable. But since it was a ‘change of schedule’, technically it was not a delay, and the airline managed to weasel itself out of its accountability through that loophole. Only a 25% refund was provided, and I had to pay full fare if I wanted to change to another airline. I had no choice but to grumblingly accept to take the flight. I arrived at the airport a few minutes before 6 PM. Although the check-in counter for ‘changed flight’ would not be open until 7 PM, the staff kindly led me to an open counter of a different flight to check in. Satisfied with the boarding pass in my hand, I headed to the executive lounge. About 2,5 hours later, I was bored beyond relief. I hoped that I could browse on my HSDPA modem, enjoyed a free buffet, and relaxed, all the privileged of the executive lounge. I somehow had too much fried rice-fettuccine and pastries that within half an hour I was full. My internet connection was rottenly slow. With the PA system endlessly calling passengers to board, it was difficult to have a decent and relaxing rest. That would translate to 90 more minute of more delay. There was an unmistakable sinking feeling inside me, very close to despair. “I hope you can understand,” she quickly added. What else could I do but to muster a herculean effort of an understanding? As I sat down, another passenger, a big, dark, bald and unshaved man replaced me at the counter. Unlike me, he was not in an understanding mood. He voiced his displeasure. He raised his tone. He ranted mercilessly to the helpless desk staff. A crowd began to gather around the scene. The man still went on and on, slashing at the staff’s lame attempts at making reasonable excuses. He kept going at it for about 15 minutes before he went back to his seat with an unsatisfied air. I quickly updated my Facebook status. On the background I could catch the man’s loud voice. I thought he was continuing his angry outburst. I looked over my shoulder and I saw him talking into his mobile phone. Then he turned to other travelers, telling them that they should trash the airline’s office to attract the attention of TV news crew, so everybody would know what the airline had done to its passengers. What an angry, big, dark, bald man. 10.15 PM. A Boeing 737 taxied into the tarmac. It was our aircraft. I quickly swallowed the snack I got from the airline, picked up my heavy backpack, and sat at the front row, near the gate. After a few minutes, I left my seat and stood in front of the gate, determined to be the first to board the plane. Other passengers quickly formed a line behind me. About 15 minutes later, the gate was opened, and I picked up my steps toward the plane. As I entered the door, I saw a young flight attendant standing, squeezing her eyelids several times to stay awake. I promptly gave her the nicest smile I could came up with under the circumstances. She smiled back at me and greeted me warmly. After stowing my backpack securely in the overhead bin, I took my seat and looked around at the rest of the cabin crew. I saw pretty young faces, in uniforms designed to flaunt their beautiful forms. They swiftly went about their tasks of assisting passengers into their assigned seats and put away their cabin baggage. They did their best to maintain a professional posture despite of exhaustion. One hour into the flight, and after a box of snack and a cup of mineral water, everybody was content. Even the big, dark, bald man seemed to have forgotten about his anger, and talked to the stewardesses about (presumably) the airline merchandise they were selling. How can anyone stay angry when seeing this excellent crew? I honestly disliked the airline for failing to keep its promised schedule. But I must admit that they have a highly professional crew. And here we come to the moral of this story. Sometimes, things (or s**t, as some people say) just happened. There is nothing you can do about it. There is no point of worrying about it. You cannot keep it from happening, and you cannot stop it from completing itself. When s**t happens, focus on the task at hand. Nobody can stay angry at you when you do that. And making sure that you look gorgeous while you are focusing on your tasks will considerably increase your chance of being successful in appeasing people’s anger. In New Year’s Eve, we customarily go to Church for the year end service. Not this year. I am down with cold, and I could not bear the thought of having to fight new year’s eve traffic. So we stayed in our apartment and rested the night away. We just moved in here, and for some reason we still have no TV. So I made myself a mixture of tea and herbal medicine, ate some bread, and sat on my beloved Poang chair. While I was listening to the Christmas music (yes, because that’s the only music we have in our still spartan apartment) played on my I pad, I thought about what we have experienced throughout the year. There were hits and misses, good times and bad times, and everything else in between. I browsed through my photo albums on Facebook, and I saw a lot of reasons to be thankful. Yes there were unpleasant things that happened, but there were also plenty of good things that happen to us. For all the good things, I am grateful. For all not so good things, I am thankful. For the new year, I resolved to complain less. Life is full of so many good things, and I would be a waste to let myself be consumed with hate, irritation, and disappointment. I just want to enjoy each day at a time, taking good care of myself, drink the wine, and have the desser. And so he keeps going. That it would be difficult for me, an introvert, to see the positive, is something I realized early. But there’s nothing to lose. So, why not? I can do it, and it’s gonna be fun! I suppose the most important, and the greatest of all wisdom is to know when to shut up and let others do the talking to gain your objective. This took place about 13 years ago, before ‘mobile phone’ became ‘mobile device’, before the word “iPhone” was coined, and before people adopted the habit of uploading pictures of their lunch and tweeting trivial thoughts. It was an overcast day, like many other days, in Seattle. I wanted to call home to Jakarta, and I needed to get a calling card. Lucky for us, just across the intersection from the hotel was some kind of a general store. It was not a big supermarket nor a chain drugstore, but you can find most of your needs in there. In the narrow aisles in the low-ceiling and medium lighted space were stacked snack, soda, food, medicines, beauty and hair care products, magazines, newspapers, and a sundry of other daily necessities. Almost every nook and cranny was filled merchandise. When I got there, there were customers standing in line in front of a counter. Standing behind the counter was a tall blond young man who, I think, was not older than 19. His slender torso was covered by a white polo shirt, protected by the store’s dark green apron, and his thin, pale complexioned face was framed by a crew cut hair. “Do you carry calling cards?” I said. Instead of directly giving me a yes or no answer, he replied with another question. I lost my thought for a second at the unexpected response. Why does he need to know the country I want to call? Any calling card can call to any country, right? I was taken aback at his reply for two reasons. One, I never met anyone who was willing to promote a better price in another store. For all I know, a salesperson like that will soon earn his termination for sending customers to a competitor. Reason number two, how on earth did he know that the cards in the other store had better rates? Did he have a habit to compare callling card rates? Seattle is one of the gates from Asia into mainland US. If you take a stroll in Southcenter Mall in Tukwila, you can meet many Southeast Asian men and women, young and old. According to demographic data, in 2010 Asians and Pacific Islanders make up 13.6% of the population of the City of Seattle. That makes them the second largest population by race in the city. Come to think of it, it was really not a big surprise if someone in Seattle can know so far about making calls to Indonesia. He then proceeded to give me directions to the ‘Blue Moon’ store. I thanked him, and walked to find the place. It was a bakery owned and run by Chinese proprietors, and they did sell calling cards. I never found out whether the rates were better than the ones sold at the General Store. All I knew was that when I left Seattle, there was still some credit left in the card, even after I used it to make calls half a world away for hours. Always think in the customer’s best interest, even when it means directing the customer to another business who can give a better service. That is the price for gaining customer’s trust, and to build long term relationships. Hoard as much as possible knowledge and information that you know can help you serve customers. It will help you going the extra miles for your customers, and win the goodwill to return the favor to you. I gave up hoping for a quick check through the immigration when the officer from the Department of Homeland Security put my passport into a red folder and motioned me to step aside and wait. Out of thousands of passengers arriving in LAX that day, I was one of the lucky ones who had to go through a secondary screening. It must have been difficult for the officers, too. They had to deal with hundreds of screened passengers, most of who might have difficulties to communicate in English. Looking back at that day now, I understand why the officer had to speak to passengers in short, monosyllabic sentences. It was easier to say with authoritative tone, and easier for foreigners to understand. But in that day, that was enough to send my adrenaline level way up, and changed me from confused to distressed. So two years later, when I was told to wait for an officer to interview me, all the harrowing memories came back to my mind. My heart rate began to climb up in antiipation of what was coming at me. And then, I was surprised. The DHS officer was a young man, probably in his late 20s, with a unconcerned air about him, and an easy attitude. He greeted my with a smile, and began to check through my data in his system. “Sorry, the system sometimes freezes up on me,” he said apologetically when he had to wait for a few moment for the computer to respond. And while waiting, he made a Donald Duck voice. Suddenly I felt the tension inside me dropped like a stone. I never had a more pleasant time with any other border inspection officers anywhere. I was still smiling when I joined my fellow travelers beyond the gates. And I am still laughing whenever I remember that incident. I learned two things from that experience. 1. You can have fun while doing a very serious job. 2. When you have fun at your job, other people will be more willing to cooperate with you. Have a sense of humor. Life is difficult enough as it is. Why not live it with a happy heart? When in a new place, I make an effort to try something new. For example, when traveling to a new place, I would veer off the familiar, and try local food. This is the reason why I rarely go to a Starbucks, McDonald’s, or any of the well known global brand when visiting a city. I would look for a local restaurant or local coffee house for a different taste. Like this bowl of ramen that I just had for dinner. I’ve been wanting to try the restaurant for a long time, but didn’t get the opportunity to do so until now. And even then, the reason that I finally chose this ramen house was because other places were full with saturday-nighters. 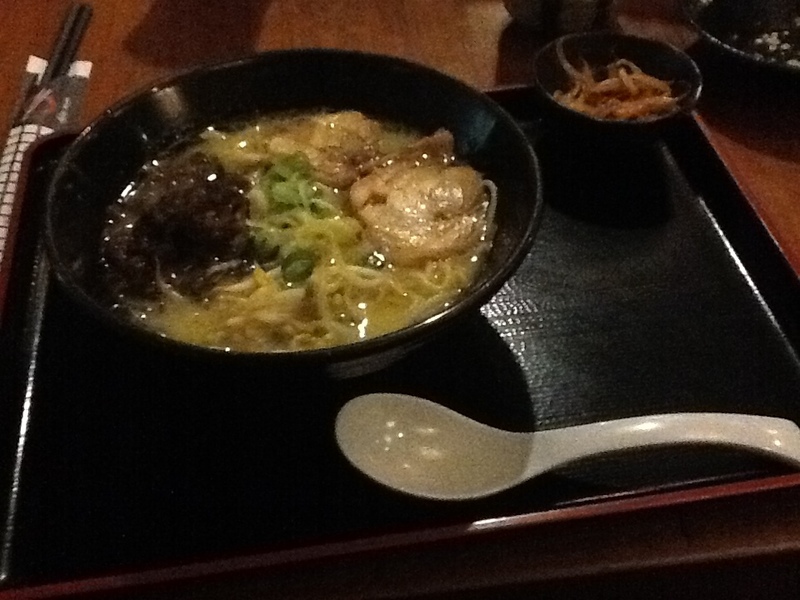 Even then, I was so glad that I ate here because the ramen, especially its broth, was exceptionally rich and delicious. Trying new food can really widen your horizon. Before I visited Seoul, I had reservations regarding Korean food. I heard about kimchi, bibimbap, and I’ve seen some korean specialty restaurants in Jakarta, but I barely had the interest to try one. And after three bibimbaps in three different occasions (two of them as airline meals), now I look at Korean restaurants with a curious, almost a longing, attitude. Imagine what trying an entirely different experience and meeting new people can do. I remember the first time I held a live firework tube in my hand. Before that, whenever I wanted to light a firework, I would put the tube against a solid thing, like a brick or a flower pot, lit the fuse, and ran to safety. Until one new year’s eve someone (I truly forgot who it was, but I must say I’m thankful for the forceful persuasion from the person) told me to lit the fuse, hold it high above my head, and aim it at an empty part of the sky that was free from electric lines and trees. I counted each blast with a racing heart, fearing that the next one would explode in my face. After the final fire, I found that I was still alive and unscathed. I stopped fearing firework since that day. I think would count anyone as fortunate if he could spend each day to conquer one thing that he fears. The more fear we defeat, the wider the boundaries of our lives become. And one day, our lives may become simply boundless with possibilities.